NOTE: The Children's Learning Museum is a defunct organization. These pages are preserved here merely for archival purposes. 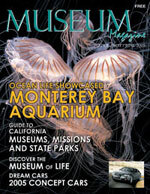 The vision of the Children's Learning Museum is to create an oceanic exhibit. This exhibit will focus on the botanical life and landscape of the sea and the impact of global climate changes on aquatic habitats. Our goal is to create a visual experience of different underwater communitities through interactive displays and presentations. Oceanic topography will be explored, including the continental shelf, submerged mountain ranges, volcanoes, and canyons. Children will learn about sea creatures, plant life, and the way they interact with each other. This exhibit will give children the opportunity to learn about these important subjects in a visually stimulating and hands-on learning environment. We are continually adding new content to our site, so please check back again soon!